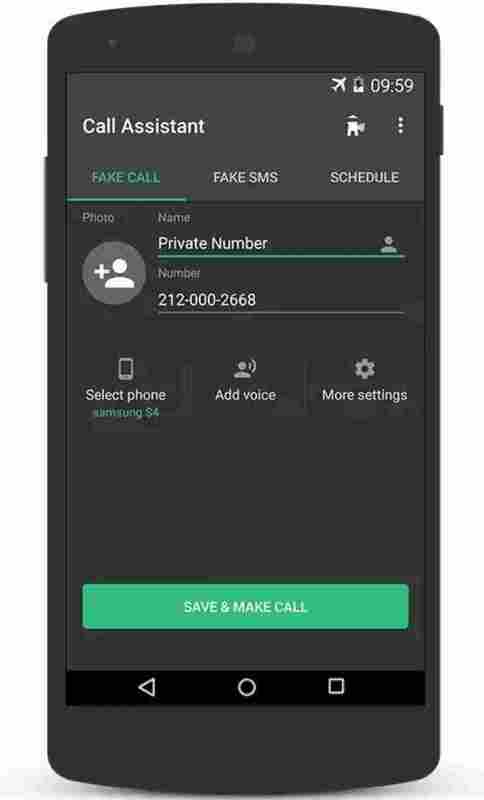 In simple terms, today's tutorial on "how to fake call (incoming calls), using a call assistant or fake caller id app on your android smart phones" will do nothing else but to help you get out of tight (very tight) situations, where it is only an urgent phone call that could save you from the moment. Let me give you some simple illustrations to help make better your understanding. Say you went to visit a lousy and talkative friend, who just keeps talking and doesn't want you to go back to your place. Why not use the fake call app to fake an urgent call (probably from your grandma, asking you to run home). And off you're gone. See, he wouldn't have any more reasons to keep you to himself/herself. The fake call app can as well be set in advance just like an alarm clock. Say you booked an appointment or date with someone who for no good reasons, you don't just think spending much time with him/her is a very good idea. All you have to do is set the fake call app right before leaving your house, put a timer on it, and as at the appointed time, the trigger goes off, and your leaving won't look in any way suspicious. Cool Right..? So, those are just a few of the many possibilities, that one can achieve, while making use of the call assistant app. The rest of the features will be left to you to explore and discover them yourself when you download the app. But meanwhile, lets take a quick walk through of the app, how to set it up, and make use of it. 1. 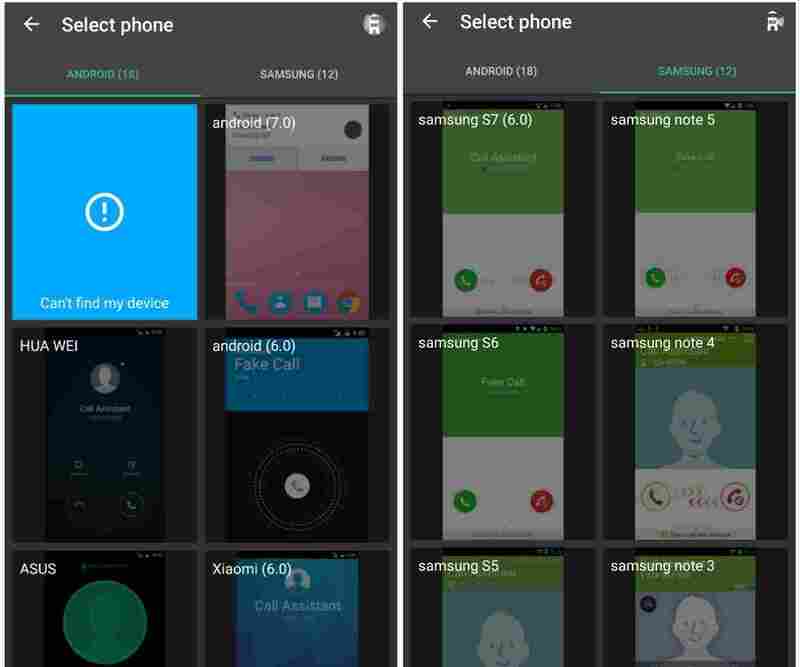 Setting Up The Fake Call App On Your Android Smart Phone. So in setting up the fake call app, first things follows first, which is downloading and installing the app into your smart phone from google play store, and which you can do from below. 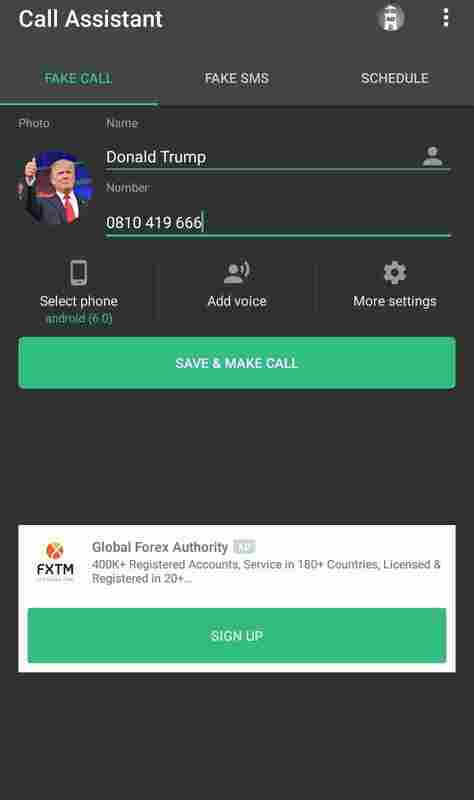 After downloading and installing the fake call app, open it for the first time, and you are presented with this interface, which is where the whole fake thing can be setup from. There is the fake call, and fake sms options, whichever one you want to fake, the choice is yours to make. 2. Making Use Of The Fake Call Android App. So in order to make our first fake call, i will just have to use any random phone number, and a name, a picture can as well be added, if you choose to. The "Select Phone" button allows you to make a choice from different caller interfaces. It ranges from different versions of android, to different models of Samsung devices. 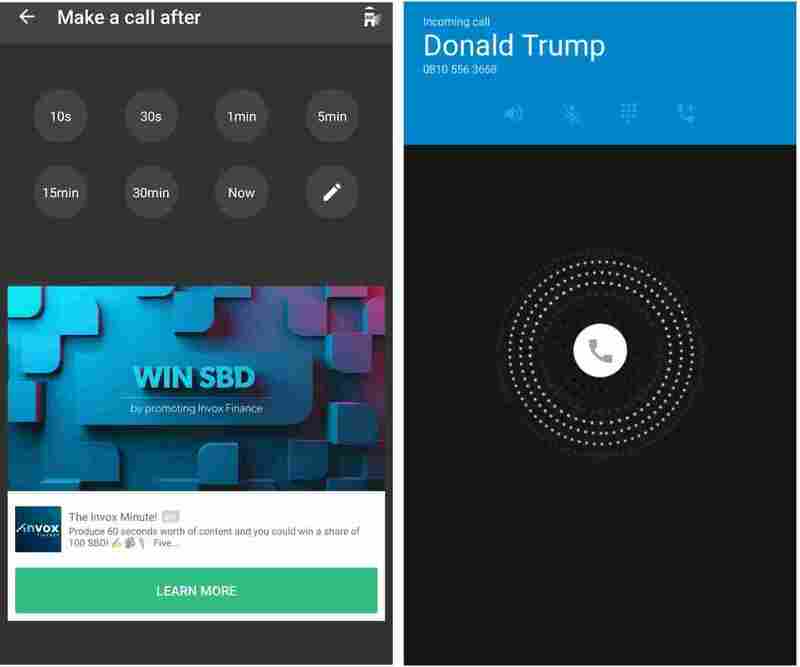 In case you couldn't find a perfect match for your device, you are as well given the options to take a screenshot of your device's caller interface and send to the makers of this app, so it could be added ASAP. Then the "Add Voice" button allows you to add a custom pre-recorded voice for the calls. 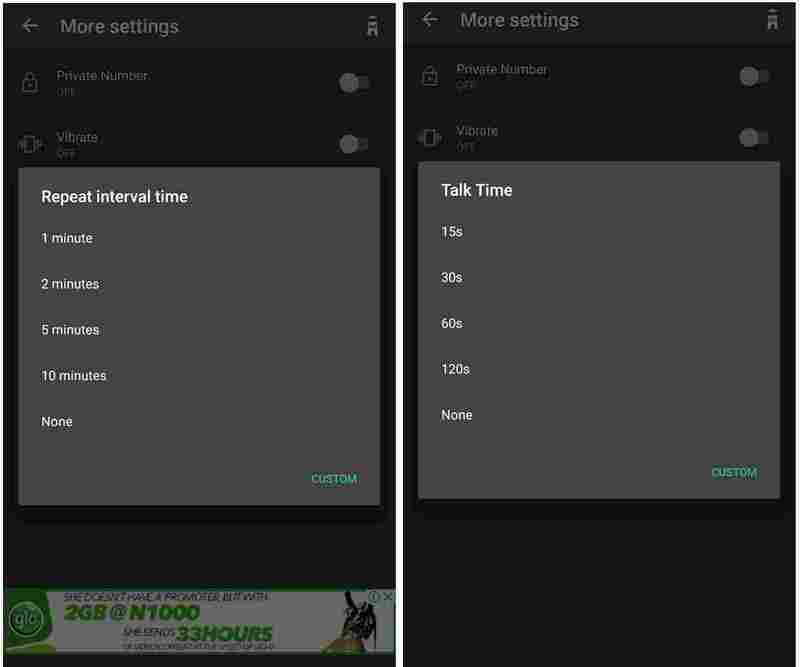 Then coming to "More Settings", you're given options to either flag the incoming call phone number as a private number, turn on/off vibrations, set the required ringtone, the repeat call interval, talk time in seconds to minutes, and the call type. So after everything has been set to your preference, press the "Save and Make call" button, select the delay timer, and voila, you will receive an incoming call right into your mobile phone depending on how much time was set as the delay time. So for the sake of this tutorial, i'll set mine to "Now". So guys, that is it for the fake call android app, please note that same settings also applies to the fake sms option. Meanwhile tell us what you think about this app, and as well tell us how your experience has been with it, if you've been making use of it before now. Don't forget to share and subscribe to our newsletter. 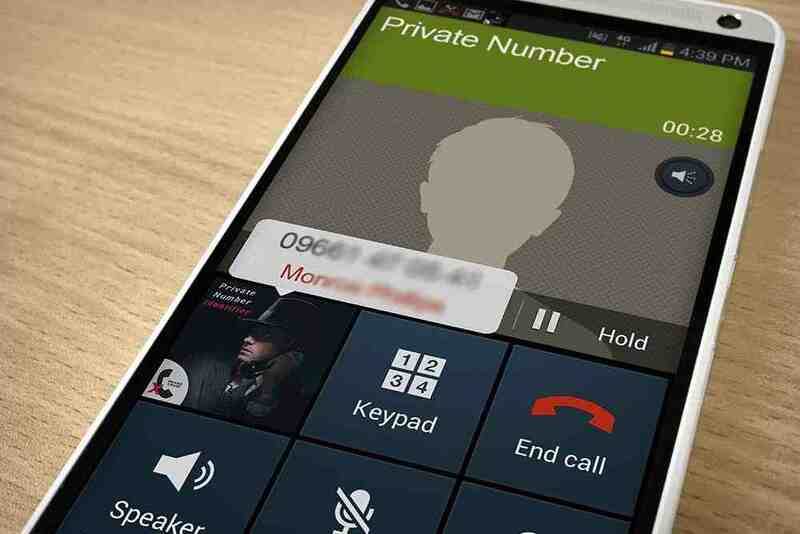 Read Also - How To Hide Incoming Calls Caller Identity On Any Android Phone.